Stop throwing away old notebooks. Say YES to be an environmentalist. Everlast is endlessly reusable-the last notebook you'll ever need. The papes of notebook is made from stone and no longer causes damage to trees. Use Everlast with pens, highlighters and markers from the the Pilot FriXion line and let the ink dry for 15 seconds to allow it to bond to our specialized paper. When you're ready to reuse, just wipe words with a damp cloth, and watch them erased like a magic. Share notes and sketches with colleagues with app even if they weren't in the meeting. 1x Zohulu Notebook, 1x Erasable pilot frixion pens, 1x Instruction card. The package includes one FriXion pen and you can buy more on Amazon and in retail stores for longer use. Gel pen is NOT recommended to write on this notebook! 2018 Upgraded Durable Materials: Original from ZOHULU Team which tested more than 5000 hours before releasing. Erasable and Reusable: Use everlast for people who often need to draft. The words can be wiped clean with a damp cloth or napkin when writing with pilot frixion pens. Works great for school and students. Like math rough not book and so on. Works with any pen, marker or highlighter from the Pilot Frixion line (one pen is included). Allow 15 seconds for ink to dry in order for it to bond to the specialized pages(Left handed are not recommended). Scan and Preserve the Notes with App: Blast your notes to Google Drive, Dropbox, Evernote, Box, OneNote, Slack, iCloud and email, Name your notes for quick search whenever you need. 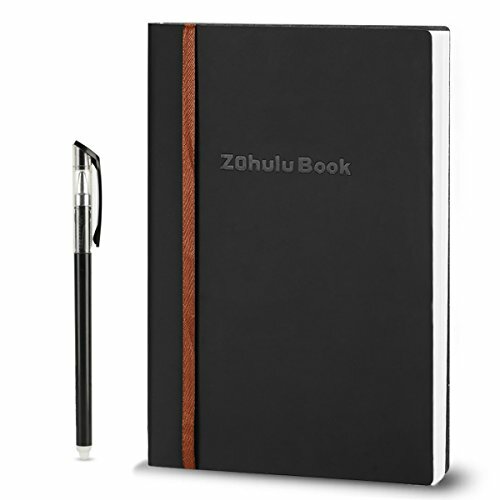 New Leather Appearance Designed for Gift Option: Suitable for students, engineers, designers, managers and anyone who wants to be more organized, creative and productive. Bilingual annual play as ssen in the picture. If you have any questions about this product by ZOHULU, contact us by completing and submitting the form below. If you are looking for a specif part number, please include it with your message.